If you’re looking to take back your independence, look no further than the K-Pipe 125. Priced at just $1,999, the K-Pipe 125 is a remarkably economical and fuel efficient bike featuring a confidence-building seat height that puts feet flat on the ground. Designed for low maintenance, it uses a 125cc, air-cooled, SOHC engine coupled to a four-speed transmission that provides the kind of control expected of a larger displacement bike. An electric starter with a kick start backup completes a package that makes the K-Pipe 125 the perfect choice for either the entry level rider or the economy-minded veteran. If you’re ready to Learn How to Ride go to: www.msf-usa.org to find a new rider course near you. 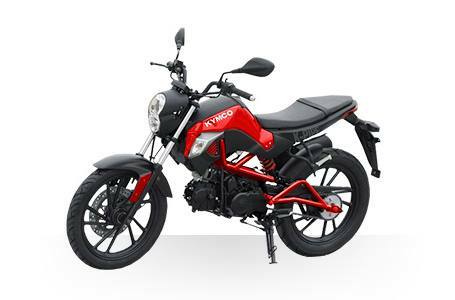 Warranty: 2 - Year Factory Warranty, extended coverage available with KYMCO extended protection plan. 2 - Year Factory Warranty, extended coverage available with KYMCO extended protection plan.